As mentioned in John's bio, he, Joe Cooley and Joe Leary toured Ireland together in 1963. Ciaran MacMathuna recorded a session at Bridie Lafferty's house in Homefarm Road in Dublin for Radio Éireann. Charlie Piggott dug a copy of that radio program from the RTE archives and sent it to John. It arrived at John's house in San Jose, California on St. Patrick's Day, 1993, exactly 30 years to the day that Joe Cooley and John landed in Ireland in 1963. Some of this recording session can also be heard on the famous Cooley album. 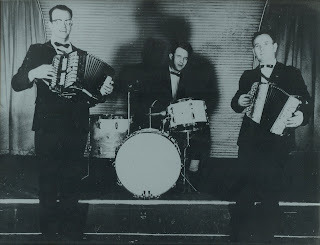 John Lavelle, Billy Soden and Joe Cooley in the Blarney Club ballroom. "I first met Joe Cooley in the house of Tom Masterson, a very well known and respected leader of Comhaltas Eireann. It so happened that fiddle immortal Sean McGuire was also present. We were all there for the Craic. 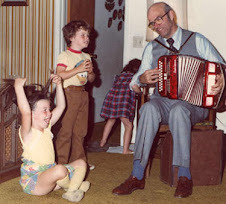 At first, I mistook Joe for a member of the Aughrim Slopes Ceili Band. That band included the great Kevin Keegan R.I.P. When I started to play, I got tremendous support from Cooley who also felt the affinity in the air. Shortly thereafter, I made a trip to England and met all of Joe's friends from 'the old days'. I have always considered it an honor to have played with Joe. I hope you enjoy listening to him speak and play in the tunes included in this blog post. More to come in future blog posts.